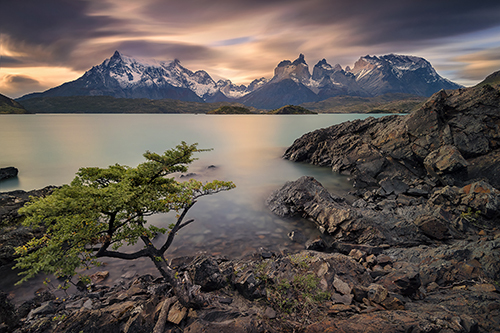 Develop your skills as a photographer, build an incredible portfolio, and immerse yourself in the untamed and rugged landscape that is Patagonia. This eleven day Patagonia photo tour in April 2020 is for amateur and aspiring photographers alike, and promises to expose you to some of the world’s most spectacular landscapes that offers under ethereal lighting conditions surrounded by towering mountains and autumn colours like you have never seen before. Your guides are not just expert landscape photographers; they are experts on Patagonia and will be able to guide you to some of its best kept secret locations and little-known subjects, allowing you to take fascinating, unique images far from the crowds. At each destination, your photography guides will be on hand to ensure that you are making the most of the lighting and subjects available, so that you return home with incredible images you can be proud of. Post-processing is an important part of creating enviable photographs, so your guides will be able to lead you through post processing on your trip to ensure your Patagonian images are the best they can be. Unlike other workshops here, this is the most affordable and longest at 13 days...and we did that for a reason...for you to maximise your time here to catalogue your own unique portfolio of work from this incredible location. Meeting in Punta Arenas around mid morning, you will be greeted by your tour leaders. We will drive approximately 3 hours to Puerto Natales. Here we will pick up any last minute supplies/food before heading to our first destination, as well as enjoy a group lunch on the way. From Puerto Natales we will drive 1.5 hours north to the famed Torres del Paine National Park and settle into our luxurious 5 star accommodation which overlooks the National Park. After getting settled into your room, we will head out to scout locations & make the most of the sunset. After our sunset shoot, we will meet back at the hotel and enjoy dinner where we can go over the details of the trip more thoroughly, get to know the group and you may ask any questions you want. Sunrise in this part of the world happens rather late, at about 8.30am so each day we will get up early for breakfast and head out for sunrise as the light is most favourable at dawn here. We will head off each morning and shoot various locations depending on the conditions. We will head to the shores of Lago Pehoe to shoot mirror reflections or if the winds are up, we can get some crazy wave action at a location nearby. We will explore the abundance of dead trees on the walk to Mirador Cuernos, and explore the banks of Lago Nordenskjöld which has you right under Los Cuernos for some unique compositions. There are also options to hike up to Mirador Cóndor or if the conditions are optimum we will hike up to the infamous Mirador Las Torres - perhaps one of the hardest hikes in the park but also one of the most rewarding vistas to photograph in the park. For those who wish to stay behind a tour leader will remain behind & shoot alternative locations. After each morning's shoot we will head back to our hotel for lunch and you will be given time in the afternoon to relax, explore & consult with your tour guides if you require additional help with post processing or further assistance from each days shoot. Sunset each day (around 7pm) will be much the same as the morning - depending on the conditions & we will shoot a variety of locations. In the event of wet/rainy days, we will be offering Post Processing Tutorials in LightRoom & Photoshop to maximise your workshop experience. After breakfast and a sunrise shoot near the hotel, we will bid farewell to Torres del Paine and cross the border into Argentina. Today is a long drive of approx 7 hours of bad car karaoke & sharing photography stories to pass time. We will arrive in El Chalten in the afternoon with time to check into our 4.5 star hotel before heading back out to shoot the famous road shot with the Fitz Roy skyline behind it. After sunset, we will head into one of El Chalténʼs restaurants to suppress our appetite. Probably with a hearty Argentinian steak and Malbec followed by a good nights rest. As with Torres del Paine our daily itinerary will be dependent on conditions as to where we will shoot each day. We will rise up early to get some breakfast before taking into the surroundings of Los Glaciares National Park. 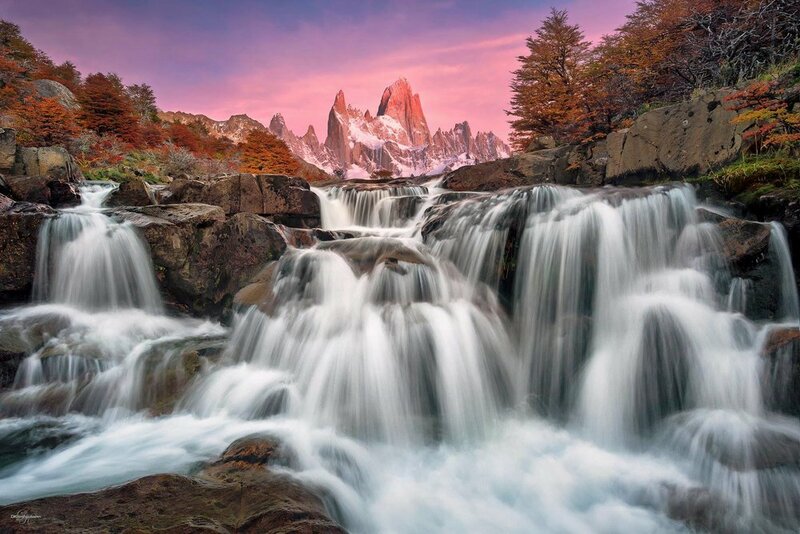 We will hike out to shoot scenes around the Fitz Roy sector with hidden waterfalls and cascades to mountain lakes like Laguna Sucia and Laguna del Las Tres. We will also head to the Cerro Torre sector to shoot the imposing Cerro Torre from Laguna Torre which will hopefully have an abundance of icebergs or we can shoot from the nearby cascades that frame it perfectly. There will be an optional opportunity (if the weather permits) to head out into the wilderness and camp at locations closer to prime photography locations such as Laguna Sucia, Laguna de Las Tres and Laguna Torre. These are optional but you will need to be prepared with appropriate equipment (tent, sleeping bag, sleeping mat etc). These can also be hired in town or bring your own from home & if need be, we can guide you as to what you will need to hire/purchase if you do. Those who prefer to stay back in town in our designated accommodation will have one of your workshop leaders to remain with you & take you to locations closer to town with less hiking as there are many places to shoot back in the town of El Chaltén. We will shoot sunrise around El Chalten after breakfast and farewell El Chalten by mid morning to head for the nearby town of El Calafate. Here, we will head to our 5 star accommodation & check-in & have lunch in town. Here we have the optional extra of heading out to Perito Moreno Glacier. One of the only glaciers in the world that is in equilibrium (it advances as fast as it retreats). This leads to some amazing scenes with massive ice carvings happening regularly which we hope to help you capture as we spend the afternoon shooting this incredible phenomenon. This is an optional extra and incurs a $500 Argentine peso entry fee to the park (approx $27 AUD). Those who choose to stay back in town, are free to wander the city of El Calafate for souvenirs, local food or enjoy the pool and spa facilities of the hotel if you so wish. Later that evening, we will all meet in the hotel lobby to enjoy our last dinner together and a few celebratory drinks to reflect on an amazing trip. Sadly, today is our last day. And we will rise early in the morning to savour breakfast and some much needed coffee before we depart Argentina for Punta Arenas, Chile. Today is a long drive, and we will stop for a quick lunch (either at the border or in Puerto Natales). Please note: As with all our tours, you will have access to our Flight Centre Corporate Team who help you book your fights both internationally & domestically at the best rate possible. We recommend booking a flight that departs after 6pm on this last day. As we will not be able to get you to the airport for a flight before that. Also, you are welcome to continue traveling in Argentina but you will need to make your own arrangements for that (there are daily flights to Buenos Aires from El Calafate). The tour is always dependent on weather, as in the Patagonian weather can be highly unpredictable. When it comes to those autumn colours, while they are most likely to be seen throughout April, there is no guarantee that they will be present. There is however always plenty to see and do if conditions do not favour any part of our original plan. A high level of fitness is required for this trip, as we will be operating in largely mountainous envioronments, where long hikes are required. There will be opportunities to sleep in campsites amongst the ranges, and much of the workshop will be outdoors. For this reason, we recommend winter clothing that is water proof and insulated.